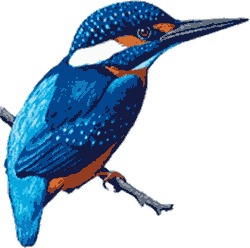 Hotel Alkyon is a family-run hotel, and got its name from the Kingfisher, a small to medium sized brightly coloured bird, of the Halcyionidae family. In Greek mythology, the first pair of the mythical-bird Halcyon were created from a marriage of Alcyone and Ceyx. Alcyone was the daughter of Aeolus, God of the Winds, and Ceyx was the son of Eosphorus, the Morning Star. They were so happy together, that they called each other like the highest Gods, Zeus and Hera. These Gods punished them at first, but then changed them into halcyon birds, acknowledging their deep love. The phrase "halcyon days" owes its origin to this beautiful myth. in the form of a kingfisher bird, can safely make her nest on the beach and lay her eggs. Hence, the term "halcyon days" comes to signify a period of great peace and calm. where the ferries to other villages, and to Samaria gorge, dock. Many villagers live as shepherd, or fisherman, or they grow olives. The village has a quiet atmosphere, and offers several shops and restaurants with great food and excellent wines. There is an ATM, and Wifi wireless internet access is available at the hotel. Several natural beaches surround the village, that all can be reached by foot, or boat. Some of them are naturist beaches. The area in the southwest of Crete, with its mountain paths and gorges, is a great opportunity for walkers and mountain hikers. Public transport is available by local bus or ferry. Boat trips and diving courses are on offer. There are no discos or night clubs. The Sfakia region has about 2,500 inhabitants, and is famous for its history of resistance against invaders, impressive nature, very hospitable people, splendid weather, quiet beaches with crystal clear sea water, good food and wine, and its marvellous opportunities to walk along the coast, hike in the mountains, and go through several of the gorges that cross the mountains. The famous Samaria gorge lies in Sfakia. The area is quiet, being without an ongoing coastal road. Transport here is by ferry boats. Sfakia, in the southwest of Crete, is Europe's southernmost point. Sfakia, "Land of the Gorges", is part of Chania province, and for Crete is quite unique as an area that is still untouched by mass tourism. It mainly consists of mountains up to 2453 metres high, fertile plains, and small villages, along the coast and in the mountains, in traditional Cretan style. All our rooms have air conditioning and a refrigerator. We can offer you single, double, and triple rooms, with balcony, private bathroom, many with direct sea view. Some of our rooms have a kitchenette with refrigerator. You can also have a refrigerator in a normal room. We have 2-bedrooms apartments with kitchenette, for up to five people. All accommodations are cleaned every day. We can arrange a deluxe taxi transfer from the airport or port of your arrival on Crete directly to the hotel. We can deliver a hire car at the airport or port of your arrival on Crete, or at the hotel. We have a free parking. Contact us for your enquiries about availability and rates or book directly on-line. We will answer you quickly.